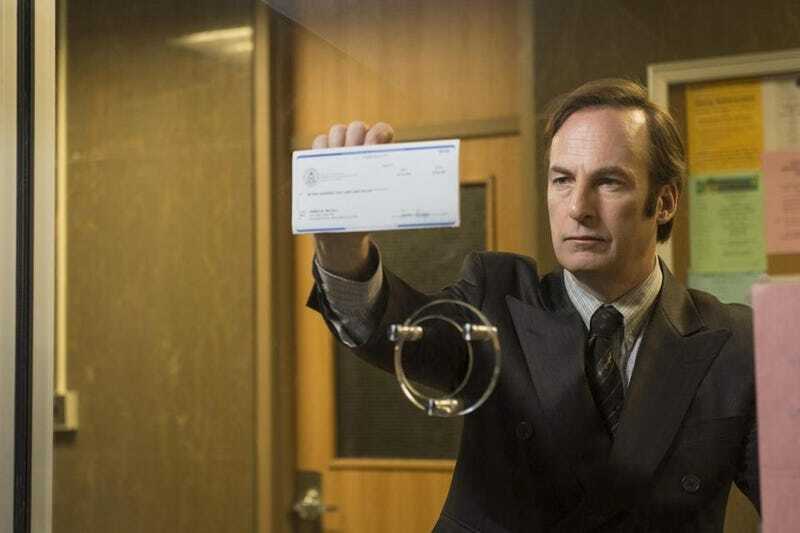 Another day, another cryptic Better Call Saul teaser. This time, the teaser for the Breaking Bad spin-off offers a few more scenes that hint at the kind of manic strangeness that is the life of Jimmy McGill (aka Saul Goodman). "YOU. WILL. ATONE," bellows McGill, played by Bob Odenkirk, in the opening seconds of the clip. "What can we do for you, Jimmy?" replies a calm man in a suit seated at a table with a woman. So what the hell does all that mean? The Hollywood Reporter doesn't know, but they can give you more details on the scenes in the teaser you just watched. This teaser shows that even though he may be called Jimmy, he's got a lot of that Saul charisma (and knack for getting in trouble). At points during the teaser he shouts, "You will atone," to a roomful of well-dressed people, tells his brother Chuck (Michael McKean), "it's all about the money," and is tossed on the ground, his mouth covered with duct tape. Classic Saul. AMC gave Better Call Saul a two-night premiere which kicks off Sunday, Feb. 8 at 10 p.m. and concludes Monday Feb. 9 at the same time.